Furry Friend Friday With Bolt! We’re back with another Furry Friend Friday interview! Today I got to chat with Bolt, a 7 year old beagle up for adoption through Greyhound Friends, Inc under their “Hound Friends” section. 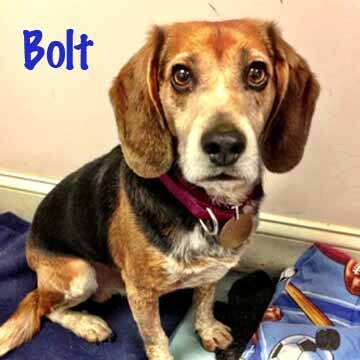 Bolt is a quiet older gentleman that came to Massachusetts all the way from Kentucky! He’s looking for a quiet forever home where he can enjoy his golden years. So Bolt, what is your favorite way to spend the day? Well I’m pretty quiet so I like to lounge around and watch the world go by from a comfy spot inside. I do like to go out for walks though, but in general I am pretty laid back. I can be a little shy around new people, but once I get to know someone I love to spend time with them and cuddle, I’m a big love bug! That sounds fun, do you have a favorite place to go for a walk when you do go out? Well the kennels are near a few acres of land so I love going out near the tree line, the woods are my favorite! As a beagle, I have a very strong sense of smell and can track for miles. The woods have so many different sights and smells, I love it and I love going with Ruthie, she’s another hound here at the kennel and is my best friend, but I get along with everyone here. Do you have a favorite treat that you like to snack on? The original Milkbones are my favorite by far, can’t go wrong with the classic! Well loud noises make me very nervous. Traffic is a good example, I can’t stand the sound of those car horns! Bolt, why would you recommend pet insurance to all pet owners? Well life has a lot of unexpected twists and turns. After being in a home for years, I never thought my owner would move to Hawaii and leave me behind, but it’s just another one of life’s unexpected occurrences. I like to believe everything happens for a reason and now I’m here in Massachusetts waiting to start my new life! Never in a million years would I have ever dreamed of leaving the south, so who knows what else could happen down the line. All pet parents should be prepared for anything, especially health-related! Bolt is right! Life does have a lot of unexpected twists and turns, and accidents or illnesses aren’t usually something you plan on. Protect your furry friend and call us at MassDrive for a pet insurance quote today! If you are interested in adopting Bolt, contact Greyhound Friends, Inc. They are also hosting their annual Open House this weekend, both Saturday and Sunday from 12-4 PM where you will get a chance to meet Bolt as well as many other great dogs up for adoption, and even a few Patriots players!